Shoebox Legends: The Best 17 of 2017! I thought a list of the top 17 cards to be featured on the blog here in 2017 might be a nice way to close out my tenth year of blogging. After all, everyone enjoys a good list at this time of year right? The rules are simple, single cards only, and they have to be cards that made their debut on the blog in 2017. I should also mention that the caption/ranking number below each card in the top 17 is actually a hyper-link that will take you to the post where the card originally debuted, just in case you missed one or two during the year and want to go back and read more. 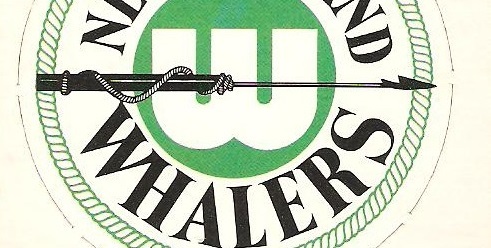 I have a minor obsession with hockey's "other league" from the '70s, the WHA. Because of this, I have a long term goal to acquire every one of the O-Pee-Chee WHA cards released during the decade. 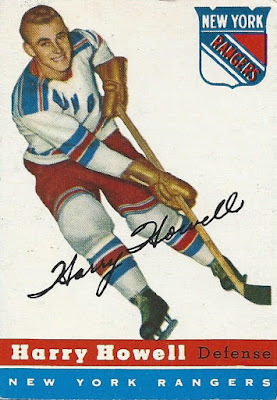 I've been focusing on the very first release to start, which were actually included in the final series of the brand's standard NHL set in '72-73. 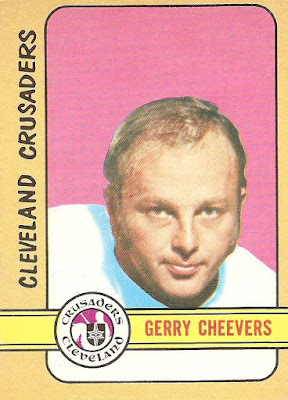 I landed one of the bigger names here with Cheevers, and the card might have made the official countdown were it not for all that white space (or pink space in this case, I guess). In any event, this is a part of my collection that I expect to get more of my hobby attention in 2018. 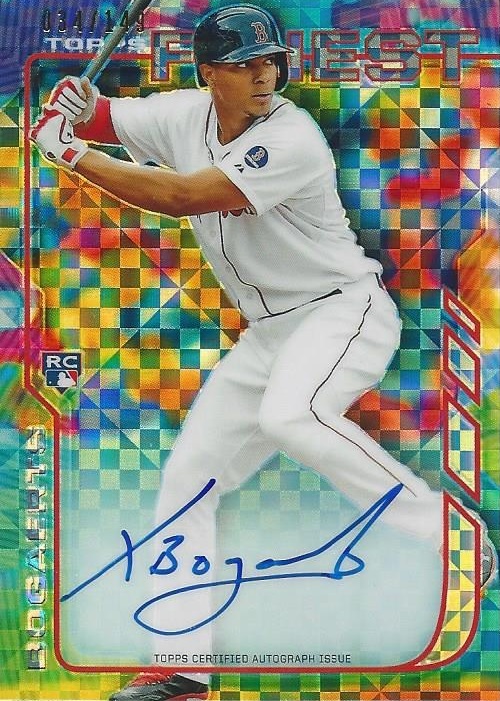 My finest (pun intended) Bogaerts card of 2017 here. I think what kept this card off the list was Xander's lackluster 2017 season. I love that you almost need sunglasses in order to stare at this one in direct light. 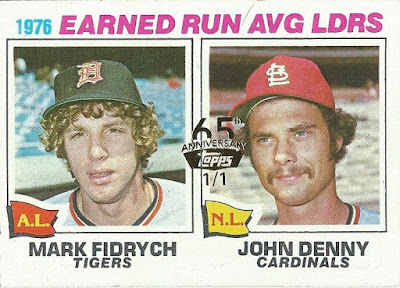 A 1/1 buyback featuring the great Mark "The Bird" Fidrych. This was the final card to be axed when I was compiling the list. One or two buybacks did make the cut, however. Sure, a hard-signed autograph of a HOFer is pretty much always a solid addition to any collection, but this one's on the list mainly for reasons of nostalgia. Takes me back to the days of ripping packs that my dad picked up for my brothers and I. A hard-signed auto, limited to 25 copies, of one of the greatest defensemen of his era, which just so happens to be the era that I grew up in as a childhood fan. Oh, and it's a buyback from one of the sets I remember most fondly from collecting as a kid. Also, in my opinion I practically committed theft by taking this home with a winning bid of $13.51. A highlight of the year for me for sure. I'm a huge fan of the Diamond Stars set from the '30s. 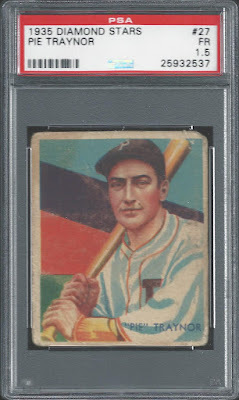 I knocked off the Red Sox team set a couple of years ago now, but this year I finally got around to picking up another in the form of HOFer Pie Traynor. This was a total impulse buy, ran across it by chance and thought the price was unbelievably low, and just went for it. I certainly don't regret it. 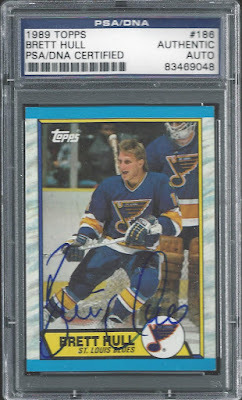 Here's another iconic card from my youth that, like the Lidstrom auto, I managed to acquire in buyback form in 2017. I dubbed this my favorite Fedorov card when I posted it back in February, and that's still the case here in late December. The earliest card calendar-wise to make the list, I actually posted this one on the very first day of 2017. 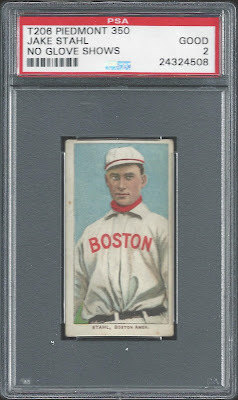 For a buyback lover like myself, it doesn't get much better than a RC of the player who at long last integrated the Boston Red Sox. This was sent to me in trade by my buddy Douglas of Sports Cards from the Dollar Store, and is firmly entrenched in my buyback franken-set! 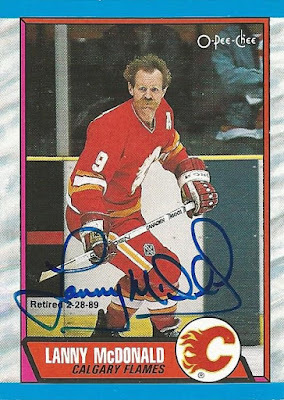 This one makes the cut for many of the same reasons as the Lanny McDonald auto a few cards back. 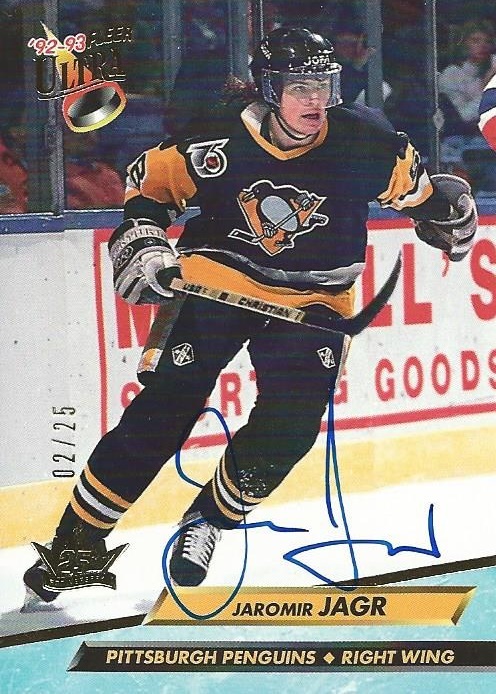 One of the more iconic cards from my collecting youth, having a copy hard-signed by the man himself makes me grin every time I look at it. 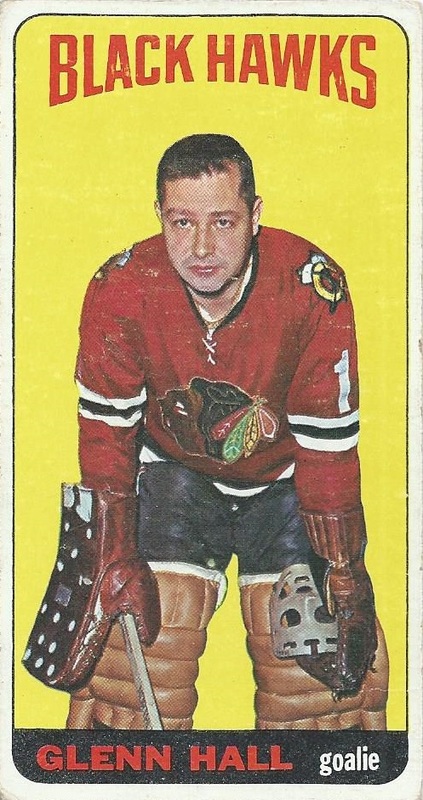 Another of my all-time favorite hockey sets here, I adore these difficult-to-store tallboys. 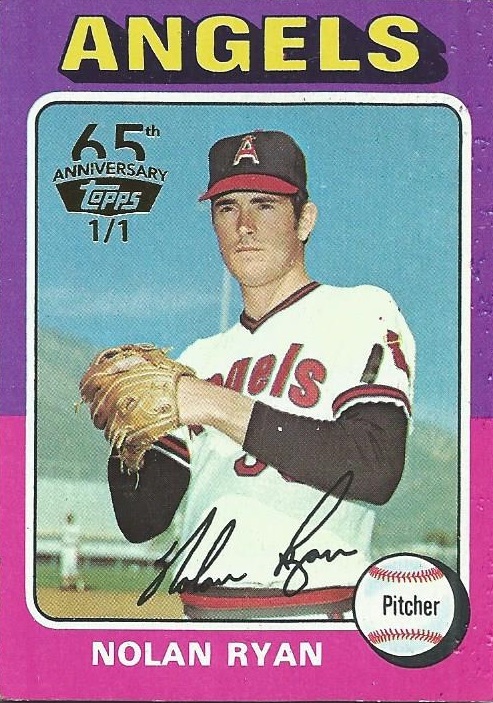 I actually made some decent progress with a few cards from this set over the last year, but HOFer Glenn Hall here was the obvious choice to make the countdown. Shipped to my door for significantly less than the cost of a retail blaster, it was absolutely one of my bargains of the year. Any time you add a new T206 card to your collection, it feels significant, and Jake Stahl here is my only new one from the last calendar year. 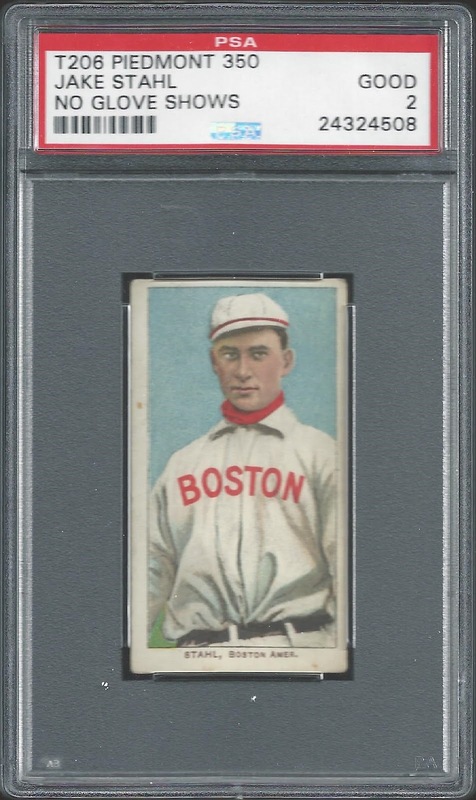 It represents my fifth Red Sox T206 card overall though, and that's a team set I'm positive I'll make more progress on in the coming year. I'm not sure I can think of any athlete, period, who enjoyed a better 2017 than Jose Altuve. 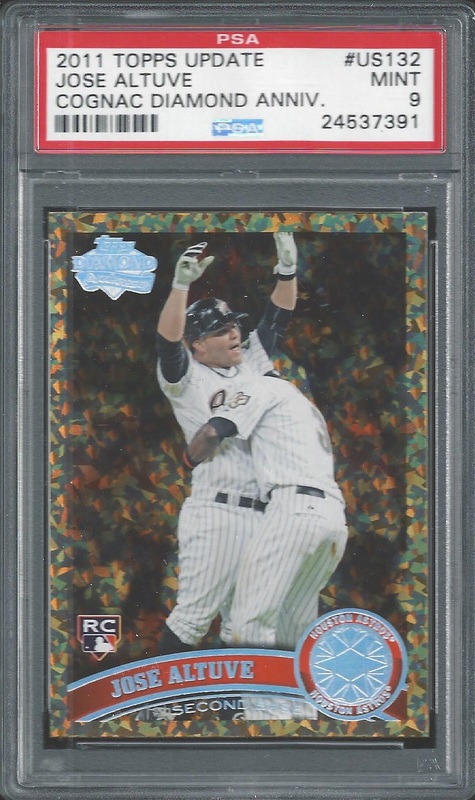 This card is the Altuve I'd prefer to own over all others, and unbelievably I was able to haul in this one, slabbed a PSA 9, for less than $20 shipped. Of course, that's because I bought it before 2017, but I didn't get around to showing it until last month, so it's eligible for the countdown. 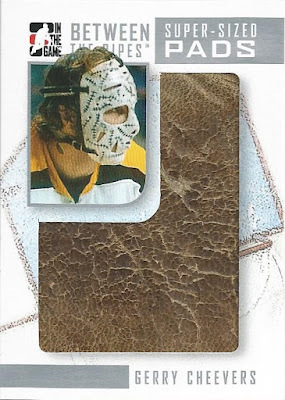 Sure, any HOFer from the very first Topps hockey release is a big enough deal to make the countdown. This one's even more significant for me personally though, as it's one of the better cards that was handed down to me from my Dad. For that reason it's one of the few cards I'd hang onto even if I decided to sell off my entire collection for some reason. 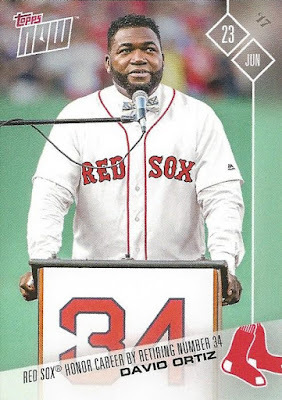 The only two Topps NOW cards I purchased this year were both from the same game, the David Ortiz jersey retirement game on June 23rd. I picked them up because I actually had the good fortune to attend this game with my lifelong best friend, his longtime girlfriend, and my wife. It's the only time I've ever attended an event in person that's depicted on a card that I know of. It was an awesome and memorable evening in Boston, and I'll always think back to it when I come across this card. I'm not generally a big game-used or relic guy, yet the next two cards in the countdown are exactly that. What can I say, I'm a man of contradiction I guess. 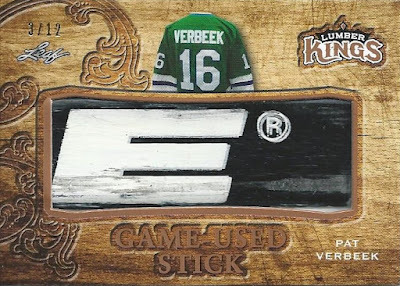 This fantastic piece of Pat Verbeek's stick was sent to me by Douglas of Sports Cards from the Dollar Store as well, the second card in the countdown that he's personally responsible for! Beyond cool to have a piece of the stick of one of my childhood idols. When I saw Dave of Wax Stain Rookie post a relic card from this set earlier this year I knew I needed to find one for myself. Just a couple of weeks later this card was waiting for me in my mailbox. Might be my favorite relic card in my entire collection. Cheevers' WHA card may have missed the countdown, but he still placed in the top 5 thanks to this beauty. 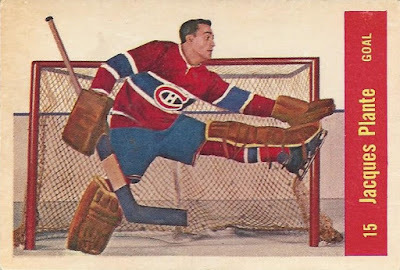 I can almost feel the pucks bouncing off this vintage pad. 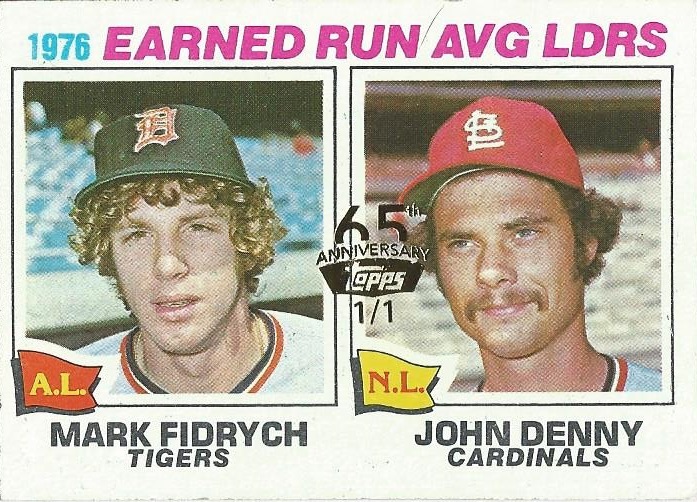 The pinnacle of my buyback franken-set to date. 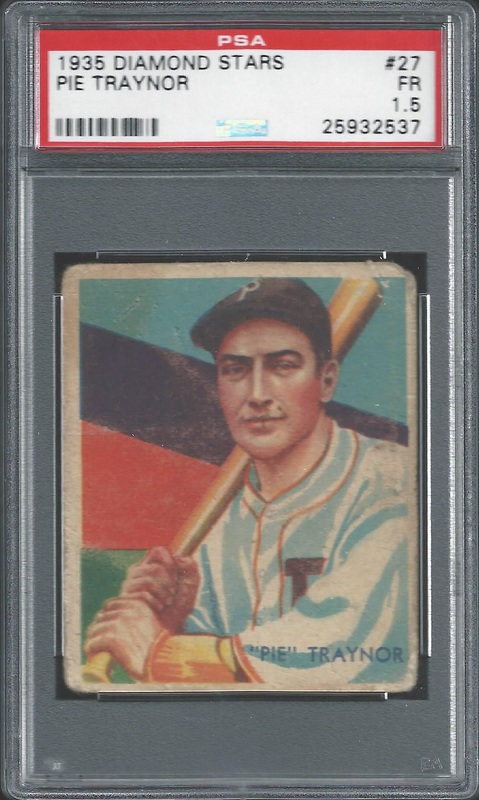 I'm not sure I'll ever acquire a buyback nicer than this one, it's essentially a lock for spot 500 in the binder (yes, I do actually keep it in the binder). Considering how much time, and how many posts, I devoted to buybacks in 2017 it's no surprise that my best one sits inside the top 5 in this countdown. I don't think this one requires much explanation. 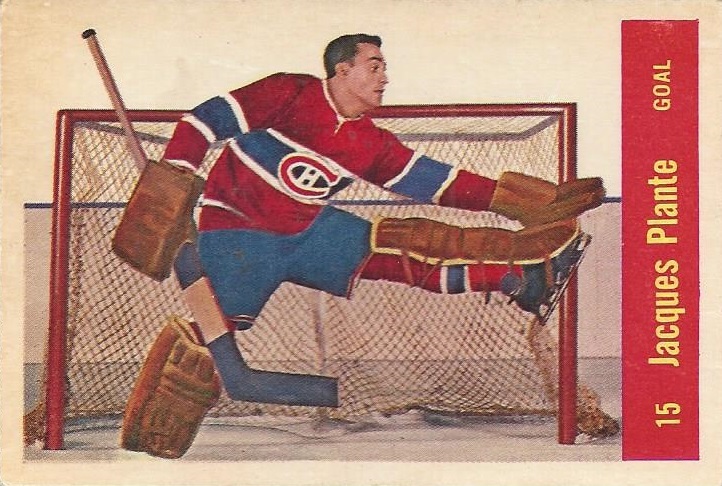 Simply a beautiful vintage hockey card. As soon as I became aware of its existence I pounced. I'm not the only collector to have that reaction either, as my posting it inspired at least one other collector to grab their own copy. Truth be told, the top 3 here are neck and neck, and this could have easily been my #1 overall card of the year. 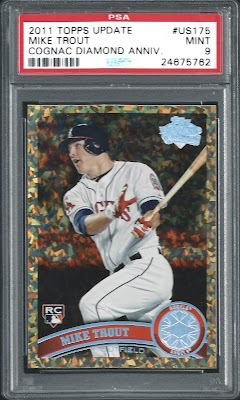 In one of my riskier plays since I got back into collecting, I spent a good deal of change on an un-redeemed redemption for this card towards the beginning of the year. I eagerly entered my code into Upper Deck's redemption site and then waited. For months and months. When I arrived home from work one day this autumn and found an envelope from Upper Deck in my mailbox, I felt like Ralphie getting his Little Orphan Annie Decoder Ring in A Christmas Story. Only my package didn't come with an after-taste of bitter disappointment, instead I'm still in a state of disbelief that I actually own this card. 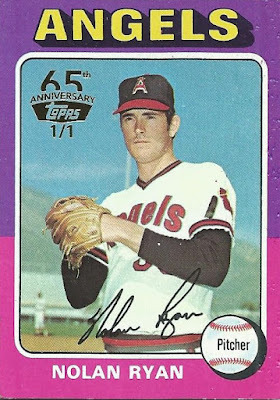 As I said, pretty much any of the top 3 could be interchanged, but I gave the edge to this fantastic rookie card of baseball's best player. Though this card only appeared on the blog here in May, I actually bought it back in 2016. I'm glad I did too, because if I hadn't I don't think I could ever afford one given what they go for now. Barring a major injury, Trout is just going to continue to rack up the accolades and statistics over the next ten years plus. It will be fun to watch him do so knowing that I've got this gem in my collection. I don't have any sentimental backstory for this card, I just plain treated myself after wanting a copy for years. I think it's a worthy card of the year regardless. Lastly, I just wanted to extend a truly heartfelt thank you to all of the wonderful people that stop by here to read or leave comments, trade cards with me, run their own blog, or otherwise just make positive contributions to the hobby. 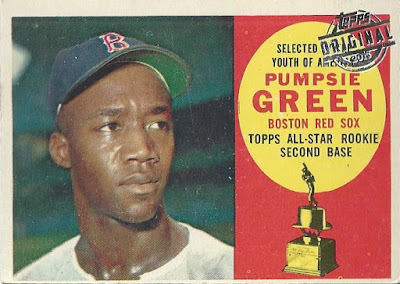 I know as well as anyone how valuable time is, and I'm grateful that anyone takes a few moments out of their day to read my ramblings about baseball cards. Wrapping up my tenth year you'd think I'd be tiring of this, but that's not the case, and all of you are the major reason why. Happy New Year's, and I look forward to interacting with you all in 2018! Way cool. I have a hard time picking favorites, there are just too many good ones (I still try, though). I think the Jagr is my favorite of these. My top 12 cards of the year will go off later today, first year with hockey in it. Glad I could help you fill out your list! Great top 17! Happy New Year, all the best for 2018! Best of everything in 2018! Great 2017 recap! Best wishes for a safe and Happy New Year!!! Great list, Shane! I don't think I bought any Goudeys in 2017, but that Traynor is making me think I might have to change that in 2018. Happy New Year! An amazing list of cards! 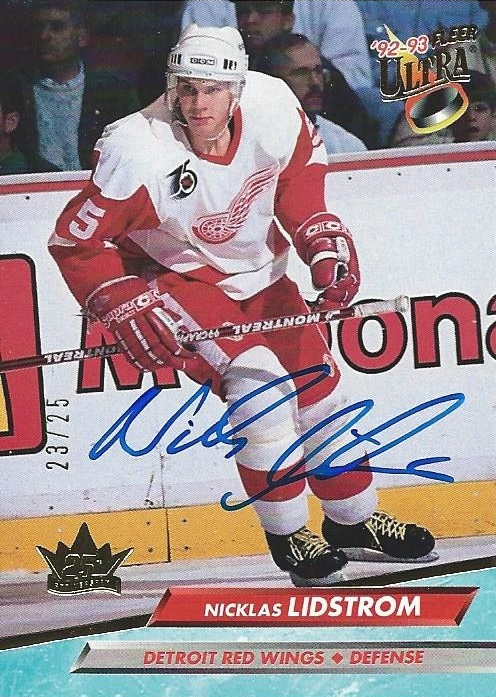 That Lidstrom buyback is sweet! Lol... I would have ranked it much higher on the list. But nothing trumps that Trout. That thing is the sweetest! Happy New Year!